Lake View, Lake Access, Lake Country Lifestyle! If you're of the mindset that you're not on vacation unless you're on the water, this is the place! With the option of enjoying two lakes directly out your back door, Lakes Camelot and Sherwood, and a private Lake Camelot Beach Club just three doors away, the possibilities for fun in the sun are nearly endless. 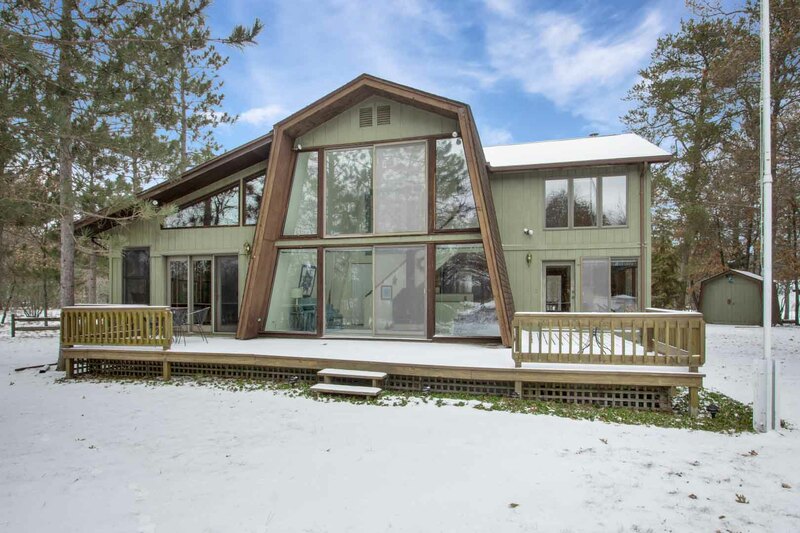 The unique design of this 3 bedroom, 2 bath water view home screams LAKEHOUSE, offers four separate gathering areas (Packers, Bears, Democrats & Republicans! ), and enough garage spaces where you may actually have to buy more toys to fill them up! Features include a spacious living area with a high vaulted ceiling, a virtual wall of windows and a retro wood burning fireplace; updated kitchen with custom cabinetry, work island, and wood flooring; fabulous dining area with a lake view, windows galore, wood flooring, and woodstove with an attractive genuine brick heat shield and wood mantle; large family room that opens to the lakeside deck, with yet again, windows galore, gas stove, and rustic carsiding on the ceiling; master suite encompassing the entire 2nd level with full bath, huge walk-in closet, and a 17x21 private retreat; lower-level rec room & bonus room; heated floors in baths; main-level laundry room; classic wood siding; covered front porch; 3-car garage PLUS a 14x20 tuck-under garage for 4-wheelers & snowmobiles (or your Maserati! ); replica Norwegian lighthouse (if desired). In Rome ... Great Lakes, World-Class Golf, Naughty Nelli, and the Great Outdoors. Garage: 3-Car Detached! 14x20 Tuck-under Garage. Replica Lighthouse is included if desired. Location: Very close to your Beach Club on Camelot. Property Borders County Land on Lakes Camelot & Sherwood. Awesome Access!